After moving to Pett Level in 1913 Epstein spent much of his time there, although he rented a room in London above Harold Munroe’s poetry bookshop in Devonshire Street and kept a studio in a nearby garage. He returned to Paris in 1914 for the unveiling of Oscar Wilde’s tomb and in the same year exhibited at the first London Group exhibition. He also became briefly involved in the Vorticist movement launched by Wyndham Lewis. Two of Epstein’s drawings were printed in the first edition of Blast, the Vortist magazine, although Epstein did not contribute any work to the Vortist exhibition of 1915 as he had argued with Wyndham Lewis by this point. Epstein was initially unaffected by the outbreak of war in 1914. He was saddened by the death of Henri Gaudier-Brzeska in action in 1915 but was keen to avoid military service because of the disruption to his work. He returned to London in 1916 and moved into 23 Guildford Street, partly to avoid zeppelin bombing and partly because his name and his accent emphasised his foreignness and created suspicion that he was a spy. During this year he exhibited Rock Drill and met the actress Meum Lindsell-Stewart, who moved into Guildford Street with Epstein and his wife and gave birth to Epstein’s first child, Peggy Jean, in 1918. In 1917 Epstein held his first Leicester Galleries exhibition and began work on Risen Christ. This work was interrupted by conscription. Both Epstein and his wife had tried to obtain an exemption from or deferment of military service. He had received a temporary exemption at the beginning of 1917, but this was not extended as he was in good health and was not a conscientious objector. 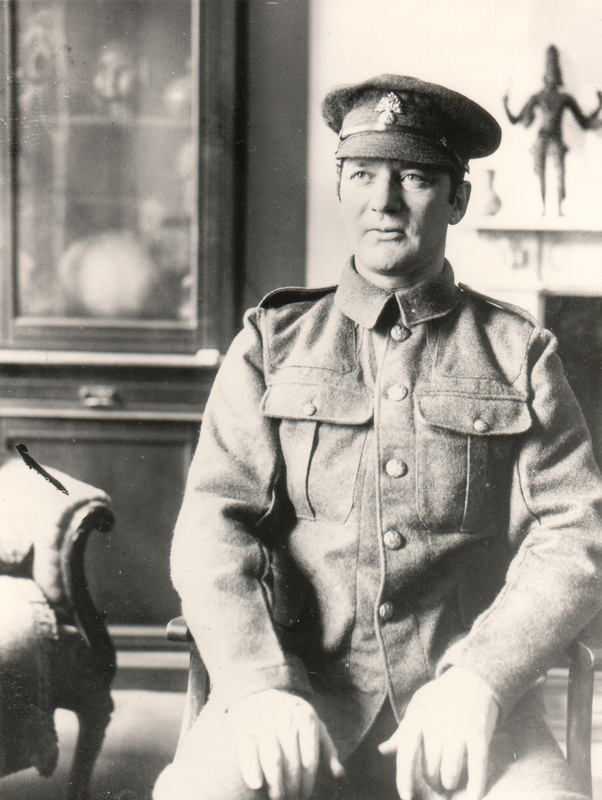 He was conscripted in September 1917 as a private in the Jewish 38th Battalion of the Royal Fusiliers. His attempts to become an official war artist were unsuccessful, and in early 1918 he was due to leave for the Middle East with his regiment. He was absent without leave on the embarkation date, and was later found on Dartmoor. He had suffered a breakdown and was hospitalised in Plymouth from May to July. He was invalided out of the army in July and returned to London, where he began a series of portraits of Peggy Jean. Epstein began to resume his pre-war life in 1919, although with significant changes that affected both his personal and professional life. Two years after Gaudier-Brzeska‘s death Epstein’s close friend T.E. Hulme had also been killed. Augustus John and Wyndham Lewis had survived, but Epstein had argued with both men and so no longer exhibited with the London Group.